LifeSize was called upon to offer a solution for health emergencies and rare medical conditions, rural and smaller hospitals have always struggled with access to specialists. At times, these healthcare organizations must transfer critically-ill patients, losing precious time and risking complications. LifeSize has a solution with HD video conferencing which provides physicians instant face to face access with the best minds in medicine. 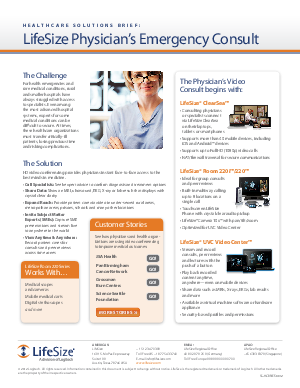 Read on to learn how LifeSize has helped practices gain an edge over their challenges.